The BLF leader says all land owned by white people should be returned to black people. 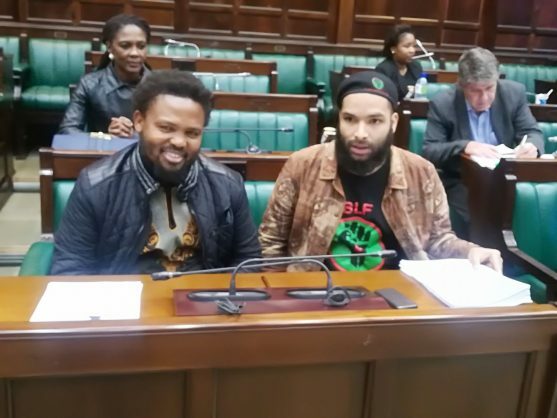 Black First Land First (BLF) leader Andile Mngxitama called for section 25 of the Constitution to be scrapped entirely to ensure that land owned by white people is returned to their black counterparts. Mngxitama was making oral presentations in parliament today on the possible amendment of section 25 of the Constitution to allow for land expropriation without compensation. The BLF leader said the section should be replaced with a declaration that all land owned by white people in South Africa is stolen property. “Express that in the section itself because then you are able to say you are just redressing,” Mngxitama said. The organisation supports the call to amend section 25 to allow for land expropriation without compensation, Mngxitama said. The BLF supports this call so that all land owned by white people should be returned to black people, he added. “That includes land in Orania and Stellenbosch, all that land must be returned,” Mngxitama said. Mngxitama said land owned by black people should be excluded from expropriation without compensation. “That is why we say hands off the Ingonyama Trust,” the BLF leader said. Mngxitama said the Constitution currently does not allow for expropriation without compensation, saying “it’s a fallacy, it’s a lie” advanced by individuals opposed to the concept. The BLF leader said at the dawn of democracy in 1994, the ANC failed to resolve the land question and that the governing party’s policies on the issue have only perpetuated the illegality of land theft. Mngxitama told the joint constitutional review committee that all land, whether unused, unproductive, productive or vacant, belongs to black people. The outspoken former Economic Freedom Fighters parliamentarian also called the hearings the “biggest political fraud” since the Codesa negotiations. The reason for this, Mngxitama said, were that the Constitution will not be amended before the 2019 general elections because parliamentarians are delaying the process and political parties are using it for electioneering. Mngxitama questioned why the ANC and EFF had not used their two-thirds majority in parliament to align the recently withdrawn Land Expropriation Bill with their resolutions on land expropriation, rather than employing the delayed parliamentary process. “We are saying these delays are deliberate and a means to give an opportunity to land thieves like AfriForum so that they can have enough room to sabotage the whole process [and commit] to economic terrorism,” Mngxitama said.